As befitting a young woman whose life had thus far largely centered on the theater, Ursula experienced plenty of personal drama in the space of just over one year. 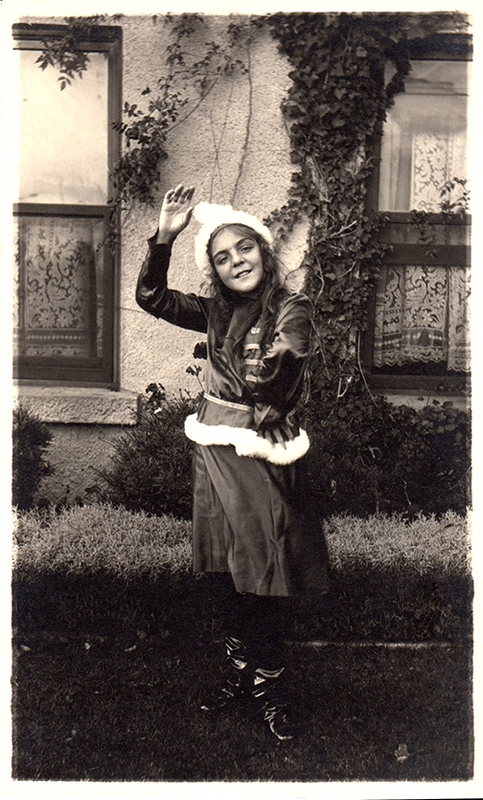 Between May 1924 and mid-June 1925, she graduated from the University of California at Berkeley; studied at a castle in France with famous opera star Emma Calvé; toured parts of Europe with her fellow students; began an Italian romance, got engaged and married; separated from her new husband; and returned to California with her mother. 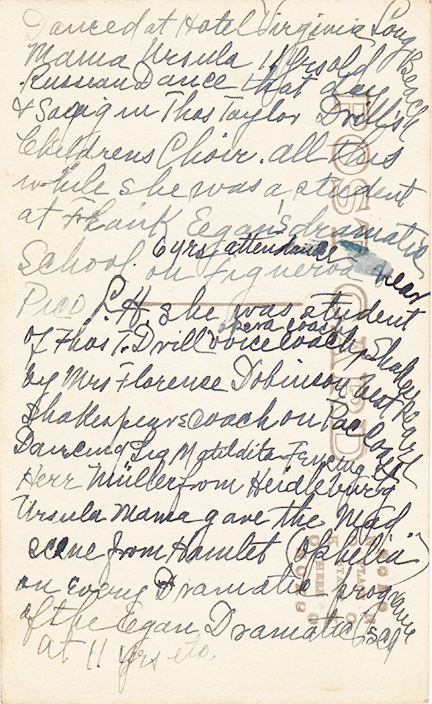 In the year between her homecoming (June 1925) and the issuance of her divorce decree (August 1926), Ursula returned to her steadfast love: the theater. 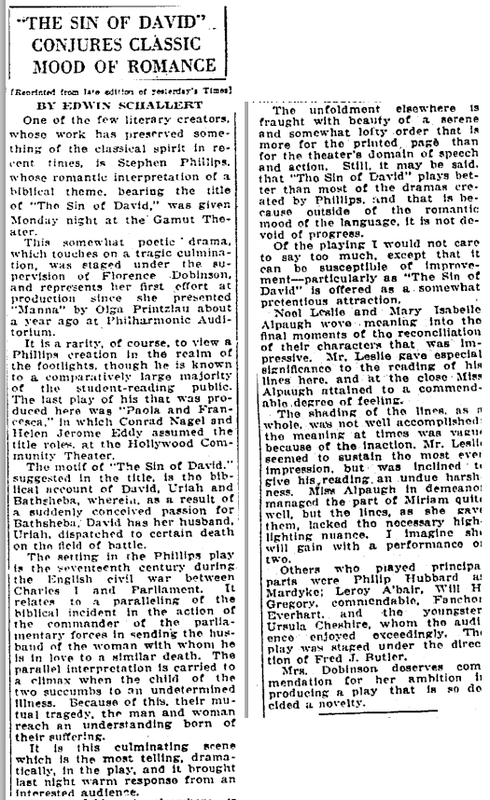 Both Ursula and her mother acted in the United States premiere of The Sin of David, a play by Stephen Phillips, who was the author of “Nero,” the college production in which Ursula danced and played the poisoner Locusta. 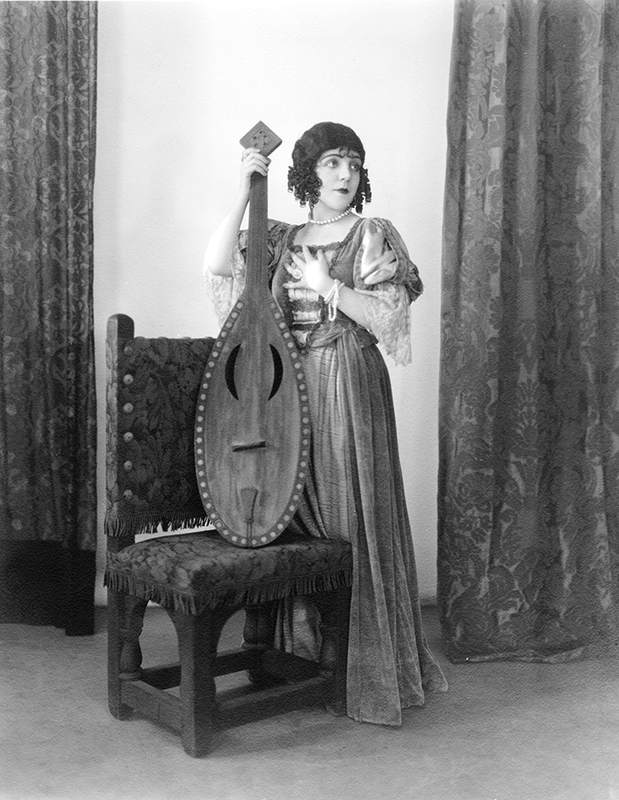 Produced by Ursula’s esteemed childhood Shakespeare teacher Florence A. Dobinson, the play opened on May 17, 1926 at Los Angeles’s Gamut Club, a men’s musical and arts society. I don’t know whom Ursula played in Sin of David. 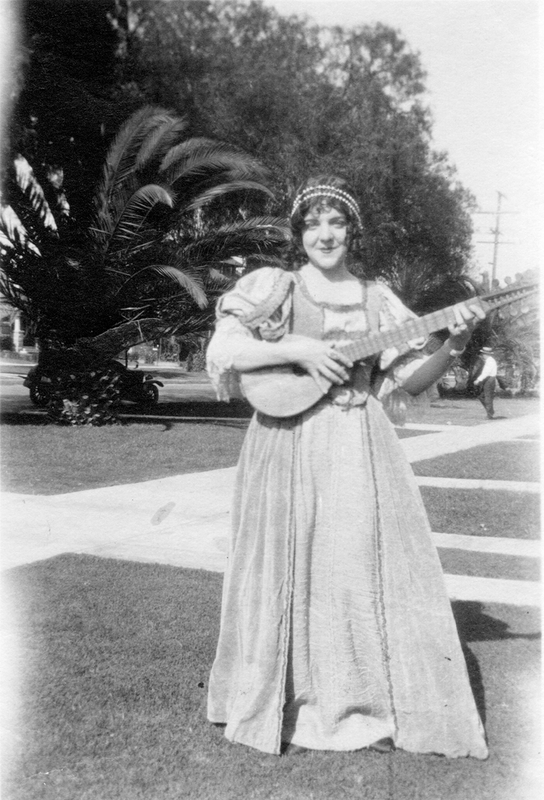 The principal female character strums a mandolin towards the beginning of the drama, but even though Ursula was photographed in costume holding some sort of mandolin (in the outdoor photo), she did not play the lead role (Miss Mary Isabelle Alpaugh had that honor). 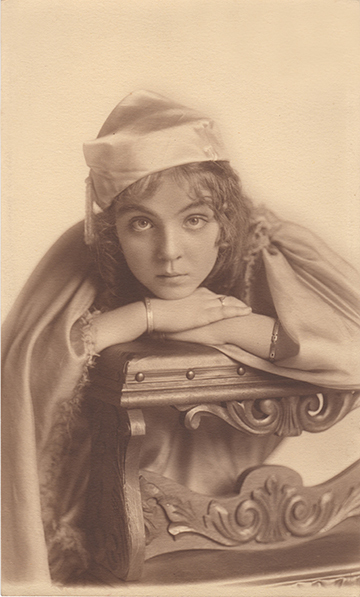 While L.A. Times drama critic Edwin Schallert offered a less-than-stellar review of the play, he did note that the actors included “the youngster Ursula Cheshire, whom the audience enjoyed exceedingly.” Go, Ursula! I couldn’t contain my curiousity any longer, and finally paged through the entire album to get a sneak peek of the clues to come. While I didn’t read all the newsclippings or the penciled photo captions, I became even more intrigued and eager to keep going on this historical adventure. 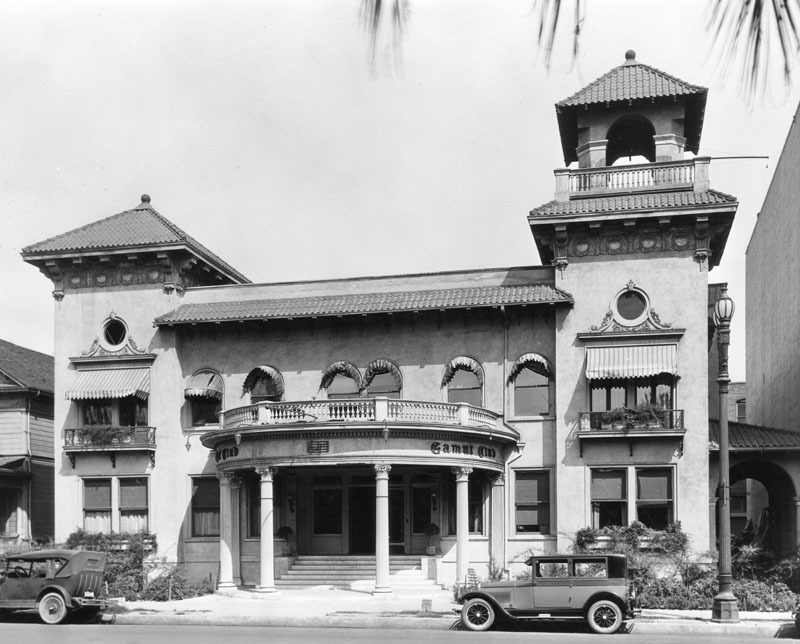 In the last post, we learned about Frank C. Ego (I mean, Egan), the director of Ursula’s drama school. 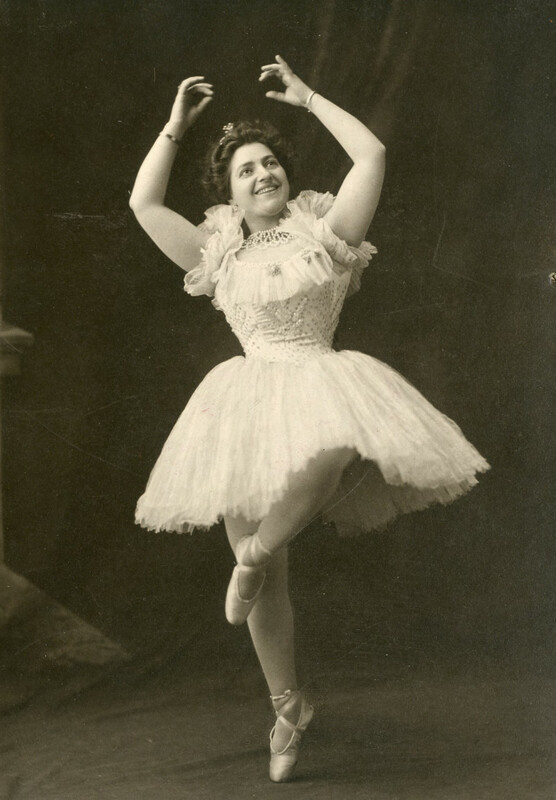 In this post, we meet Ursula’s other esteemed instructors, starting with dramatic teacher Florence A. Dobinson, the “best Shakespeare coach on [the] Pac[ific] coast,” according to the inscription on the back of the Russian dancer photo. “Herr Müller from Heidleburg,” who taught Ursula fencing, remains a mystery; I was not able to find any information about him.